When you watch a human body get sliced open or pulled apart, computer-generated innards and carefully digitized fluids pouring out like wet confetti, it's natural to feel repulsed. The graphic acts of violence that occur in a horror movie like Hereditary, an action thriller like John Wick, or a fantasy series like Game of Thrones are often meant to provoke a visceral emotional reaction: terror, disgust, excitement, or even laughter. 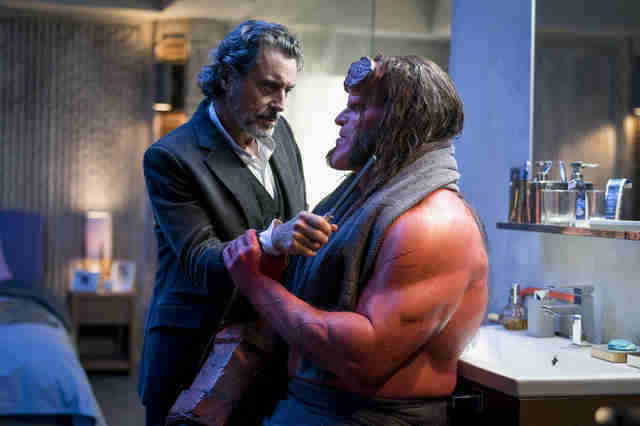 In Hellboy, the proudly R-rated and completely unnecessary reboot of the cult comic book starring Stranger Things star David Harbour in the title role, flesh is torn up and set ablaze, but you feel nothing. Judging from the disappointing box office results for the film, which debuted in third place over the weekend with a little over $12 million, audiences likely left the theater feeling similarly apathetic about this would-be superhero franchise. In comparison, Guilermo Del Toro's original Hellboy opened with $23 million in 2004 and his follow-up, 2008's Hellboy II: The Golden Army, raked in $34.5 million its first weekend. Those movies had a light-hearted, almost whimsical tone that's largely missing from this ruder, more abrasive version. Del Toro's sense of curiosity, the feeling that every slimy creature and undead beast had a story to tell, is almost entirely absent. For the new movie, director Neil Marshall (best-known for The Descent and the "Blackwater" episode of Game of Thrones) helms a more gruesome, foul-mouthed take, scripted by Andrew Cosby (co-creator of Syfy's Eureka), of Mike Mignola's cigar-chomping, demon-hunting comic-book antihero. Fittingly, Harbour, painted bright red and sporting a giant right hand of stone, spends much of the movie yelling and tossing insults at other characters. If you squint, you can see how it might have sounded like a good idea on paper -- the character is supposed to be rough around the edges and the Deadpool movies have opened the door for more button-pushing comic-book fare. But Marshall's Hellboy never finds a compelling reason to exist. It only wants to snarl. The warning signs are there right from the beginning: The movie opens in 517 A.D. with Ian McShane providing some winkingly vulgar voice-over exposition about a villainous Blood Queen named Nimue (Milla Jovovich). Apparently, Nimue was killed by King Arthur and Merlin, and her limbs were scattered all over the globe to make sure she never rose to power again. You can probably guess that her severed head won't stay trapped in a box for long -- funny how those complicated burial plans never quite work out. Known for his profane soliloquies on Deadwood, McShane has a gift for elevating even the schlockiest material, but he's called on to do too much heavy lifting both in the opening monologue and in his scenes as Hellboy's adoptive father Trevor Bruttenholm, who runs the Bureau for Paranormal Research and Defense. That's the agency Hellboy works for, tracking down the forces of evil, and when we first meet him he's on the clock, hunting a former-agent-turned-vampire in Tijuana. (A brawl in a wrestling ring ensues.) From there, the story pings back to America and then to England, but most of the visuals have a gray, shadowy look that makes the exact locations irrelevant. While Cosby's script, which draws inspiration from Arthurian lore and the pages of Mignola's comics, isn't exactly a straight-forward origin story, it's still jerry-rigged with info-dump-ey flashbacks and belabored character introductions. In addition to McShane's mentor figure, American Honey's Sasha Lane and Hawaii Five-0's Daniel Dae Kim are along for the ride as gun-wielding good guys with their own magical powers and abilities, which get revealed at seemingly random intervals in the narrative. There's little rhythm to the storytelling or the filmmaking, a problem only made worse by jarring soundtrack choices like Mötley Crüe's "Kickstart My Heart" playing over yet another endless action sequence. The movie needs a shot of adrenaline, and it receives one a little over halfway through when Baba Yaga, an unsettling one-eyed Russian witch who lives in house mounted on giant bird-like legs, scurries across the screen doing a crab walk. How does Hellboy end up in her house? It's hard to remember the exact plot justification, but it almost doesn't matter because the effects are impressive and the scene, which finds Hellboy driving a hard bargain with her, has actual tension to it. Unfortunately, Baba Yaga is not the primary villain in the film. Jovovich's Blood Queen, who wants to bring about the end of the world, eventually assembles all her body parts and reasserts her importance to the plot. Goodbye, Baba Yaga. 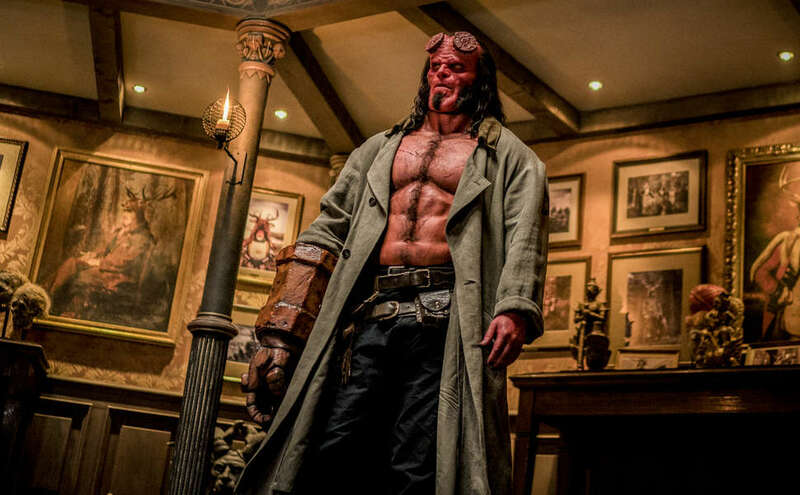 Compared to the polished, corporate sheen of the Marvel Studios and DC movies, Hellboy has a scrappier quality that makes it easy to root for... in theory. (The budget was reportedly around $50 million and the production sounds like a fairly rocky one filled with on-set conflict and scandal.) As a character, Hellboy is an underdog, an outcast caught between realms who doesn't quite fit in as a human or as a demon. It's a shame that the movie squanders that element by making the character so uniquely sour and grating, giving him repetitive action beats and one-liners that feel like they were punched-up by a flailing '80s stand-up comic. There's a pun towards the end that made my whole body shudder. The bad jokes would be more tolerable if they weren't surrounded by such relentless carnage. In an attempt to generate some third-act suspense and perhaps imitate various bigger budget films, Marshall stages a siege on London where we see winged creatures turn innocent bystanders into lunchmeat. Again, it's certainly possible to do monster movie excess on a budget and gross-out effects can be pulled off with wit. That's not what happens here; instead, the movie bludgeons you with pointless violence and then has the nerve to ask you to get all misty-eyed at the conclusion. You end up wishing Hellboy would just grow up already.